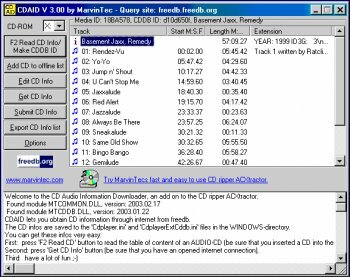 CDAID (CD Audio Information Downloader) lets you obtain CD information (i.e. artist, song title, etc.) from freedb over the Internet. No more guessing what the title of song 4 is or trying to remember the name of the CD in your tray. As a special feature you can export your CD collection to a XML or text file.